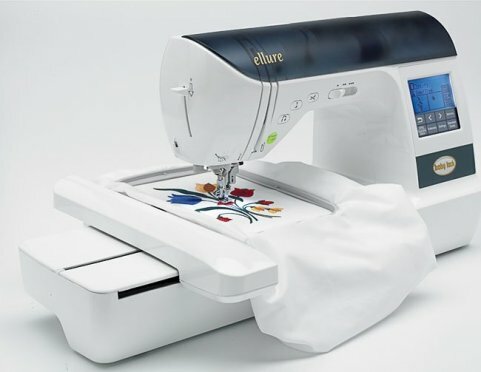 The Ellure offers solid features for both beginning embroiderers and avid sewers. With a 5″ X 7″ embroidery field and a wide variety of built-in stitches and designs, your projects will be simple to create while giving you elegant results. The Ellure’s combination of features and value is a good match for sewers who want to step up to a 5″ X 7″ embroidery field. The 106 embroidery designs in its library can be expanded through your design collection through the embroidery card slot. And with 187 stitches, you can edit and save the stitch perfect for your sewing project. With 120 frame patterns and a large library of built-in designs (including 40 Baby Lock exclusive designs), you’ll have a great starter library and an endless variety of options to make all of your projects unique. The large, easy-to-read LCD screen makes accessing your machine’s settings, designs and editing tools fast and simple. Choose from 6 character/alphabet styles for text or monograms to personalize projects of any style. The 5″ x 7″ hoop gives you more room to complete projects of virtually any size. Optional hoops in other sizes are also available. Now loading your bobbin is fast and easy! In addition to the convenient location, the bobbin case has a clear cover so you see your progress and avoid running out of thread mid-stitch. Give all of your projects a customized and intricate look with built-in stitches, including combinable utility stitches, decorative, cross, utility and satin stitches, as well as one-step buttonholes.